Pregnancy brain has my thoughts all over the place so forgive this post which is evidence of the random things bouncing around in my brain! I joined a few online marketplace/yard sale groups on Facebook since I thought I might find a few good bargains for some of the items we need/want for baby. Mostly this is not the case and it’s a lot of people selling things like DVD box sets of old TV shows for practically nothing. Part of me laughs every time I see this because it’s so random and the amount of money never seems like it’s worth the hassle of dealing with people, setting up meetups for cash/stuff exchange, etc. Might just be me, but my sanity and time has a price and it’s worth more than $15 for some DVDs! People ask me all the time how I’m feeling now that I’m over the halfway mark of the pregnancy. I think people ask to show they are interested and/or they don’t know what else to talk about, but I miss people asking how I’m doing instead of just how the pregnancy is going. I guess this begins the struggle of maintaining my individual self over baby! Also when people ask me how I’m feeling, most of the time I don’t tell them the whole truth because TMI. No one wants to hear about my horrible heartburn and acid reflux, the random back pains, or how I can barely put my socks on. Or the opposite is true with women who have been pregnant before who then want to tell you their horror stories. I guess I’ll probably fall into that category after this whole growing a human process is over. Does anyone else hoard their Amazon delivery boxes because you know there will be a day when you need them? I am especially obsessed with boxes that are good sizes for books because in my mind I’m always donating them to the library, when in reality, this only ever really happens every two years or so since I have some sort of block on reading from the books I own shelf. Although in my defense, many of my Amazon boxes have gone onto greater good like passing along to folks who are moving or using them when we did our purge/donations. What’s randomly on your mind these days? The lovely San once again organized a Secret Santa Mug Swap this year. 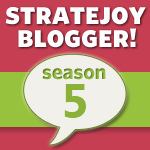 It’s my 3rd year participating! 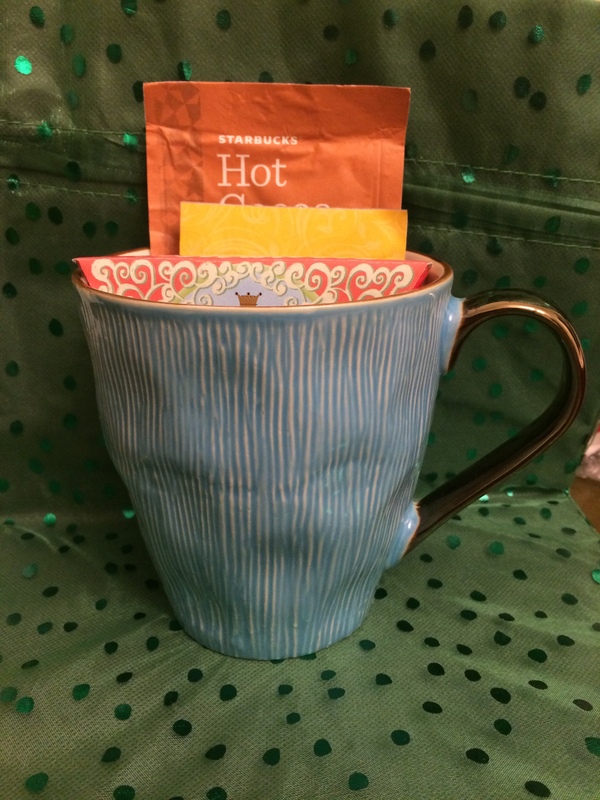 I was matched with Tanja who I sent a festive poinsettia mug and some hot chocolate over to enjoy. I completely forgot to take a picture of it before sending it off! Here’s my mug from the fabulous Cait! 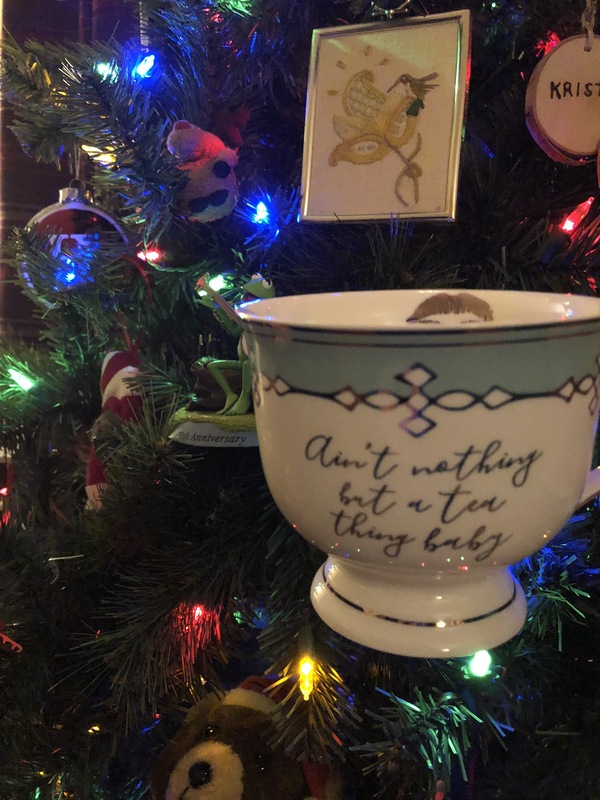 It’s a lovely mug that reads: “Ain’t Nothing but a Tea Thing Baby” with a super cute metallic lip smack on the inside lip. She also sent along some fabulous tea and delicious Walker shortbread! Labor Day weekend, the unofficial end of the summer season, is rapidly approaching. Usually the weekend brings about a bit of blah feeling about all the things I didn’t do over the summer (which is many, including my summer bucket list). This summer could be categorized in one statement- way too hot and humid. The weatherman said last night on the news that the record for hottest August was broken yesterday (previous record was from 1953), with something like 18 days over 90 degrees. We’ve spent our fair share of nights and weekends indoors, either because it was way too hot and humid to do anything or as was the case for almost every Saturday in August, it was crazy raining. I haven’t been to the beach or even enjoyed my backyard all that much, but if the past few Septembers are anything to go by, the hot weather will be with us well beyond the autumnal equinox on September 22. Even though I didn’t accomplish a ton on my summer bucket list ( minus many lazy weekends reading), it was relaxing and lazy, though to be honest, most of my weekends are that way by design. We still haven’t had Little Man on the weekends so it’s mostly been Q and myself hanging around, running errands, and laying in the AC. I had to work evening events and a few Saturdays throughout the season which is pretty rare for me so the tiredness, combined with the heat, seemed to be the theme of my summer. The summer had its fair share of delights- lobster rolls, fresh produce ( we ate our weight in local blueberries, tomatoes, cucumbers, and strawberries), a couple of picnics, and lots of grilling and ice cream. And we still have time to do a few things on the bucket list. 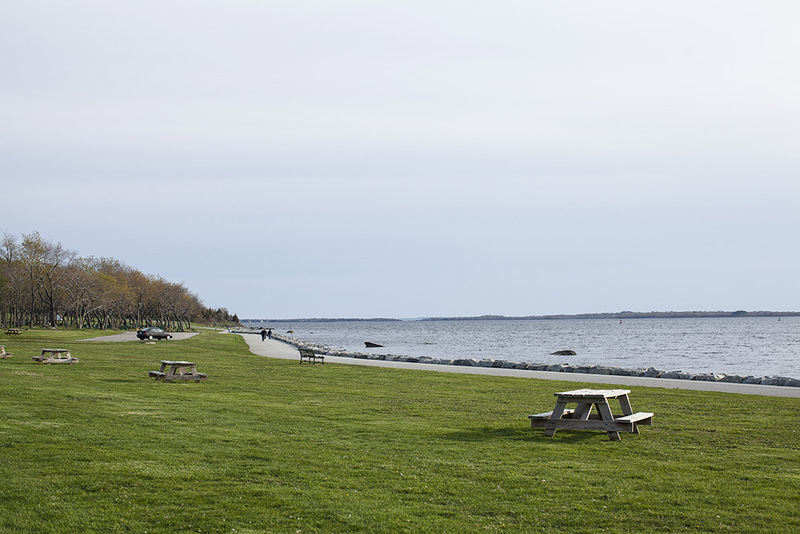 This long weekend we’re off for a little getaway to spend some time outside of our house and enjoy some new scenery. I always forget how much these small trips rejuvenate my energy- it’s amazing what getting out of your house and into a new spot can do for you! Whatever you’re doing for the upcoming long weekend, I hope you enjoy it! I took the end of the holiday week off last week which was wonderful. Back in May when Q and I decided to take those days off together, we originally envisioned them as a house project sprint, but it was over 90 degrees on the 4th and 5th (so hot we didn’t eat our 4th of July BBQ outside!, so we did no house projects. We did accomplish finally getting Q’s passport application done and a few little things around the house. After the fire on the lot next door to me last year took down the building (still no word on what’s happening with the empty lot yet! ), we have an open view to the rest of the street and sky, which meant we watched fireworks from our air-conditioned bedroom. It was pretty nice. I know I want to move on in my career, but I’m not sure what exactly that means or where I want it go. I know where I don’t want it to and what I don’t want to be doing. I’m open to moving, but the list of places I’d consider going is pretty open. The list of where we don’t want to live (NYC, Florida) is pretty set. With no set ideas on a new career step, it feels like maybe staying in museums as a way to move to a new place might be smart, but then I question that too. After a week of hot, humid, and generally unbearable weather last week, the weekend after the holiday was glorious. It was great to shut off the A/C (I hate its endless sound in the summer( and get the windows open. Saturday after errands we ended up getting sandwiches for dinner and eating them at a picnic table at a local state park on the water. It was perfect. I didn’t pass the no clothes shopping challenge I set for myself in June. I have no excuses, especially since with one of the orders I made with ThredUp, all but one of the items (a polka dot cardigan for work) were returned. Going to try again for July. Q is on some weird food diet where he’s not eating tomatoes which has made summer dinners difficult at the moment since I pretty much serve them and cucumbers in every cold dish I can- his loss! Work is crazy busy for the next 2 weeks which is not the summer norm for me so it’s a bit annoying. After a fury of reading a few books from library and even one from my owned shelf over my little staycation, all I can think about is knocking more books off my to-read list. I’ve added a ton to my library hold list, suspending them all so they don’t come in at the same time ( love that feature– I”m such a book nerd). How are things in your world? I’d love any advice or insights from anyone who’s made a career/life shift successfully– feeling overwhelmed/unsure of it all at the moment! New books: I can’t remember the last time I bought a book for my personal library brand-new. I also pretty infrequently buy used books. I choose the library for most of my physical book reads and only read free or Prime Reading books on my Kindle. I think the last time I bought a brand-new book was a few years ago when one of my beloved college professors published a novel. Fast fashion: I don’t shop at places like H&M, Forever 21, or other spots that turn out cheap clothing at low prices. This has become remarkably easy for me as I’ve gotten older since a lot of fast fashion stores are aimed at a much younger, hipper demographic than mine! Knickknacks and random house decor: I like minimal design for two reasons: my house is small and the less random stuff means less dusting/cleaning/arranging. What’s on your no-buy list? This never really happens because Q is the big TV watcher, but we’ll watch episodes of Game of Thrones, Family Guy, and South Park frequently. 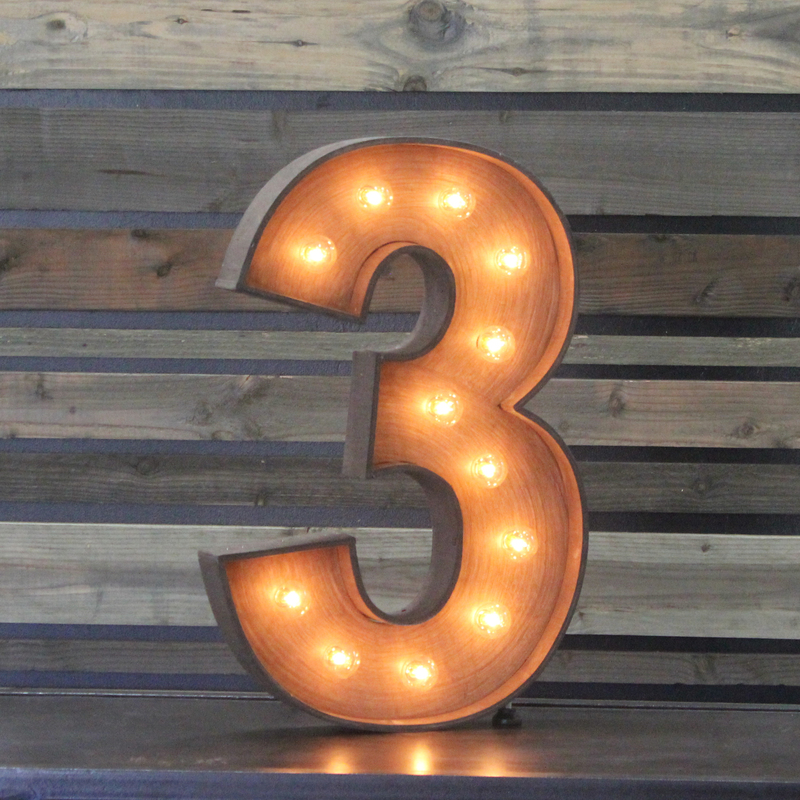 Hard to think of 3! Going to Utah in the spring to see family ( it was a favorite place as a teenager, so I’m very much looking forward to going back and introducing Q to it); celebrating Q’s 40th birthday; changes with work ( that’s more optimistic/hopeful as I want them to happen, but don’t know what or how those changes might be). Because my brain is going in about 10 different directions these days, I give you random musings and thoughts on a Tuesday morning. Work life has been STRESSFUL. Last weekend, I took Friday off because it might be my last day off until April. We had no weekend plans and slept until 10am both days. I didn’t even leave the house Sunday. When things get crazy at work, I totally go into turtle/hibernation mode. I’ve been commuting 27.5 miles each way to work and home for almost 10 years. That’s crazy and yet, I enjoy my time in the car to wake up/get my mind going for work and to wind down at the end of the day. Audiobooks and podcasts have probably saved my sanity. This morning as I was driving in, there were a TON of people talking on their phones while driving. Who the heck are they talking to at 730 in the morning? 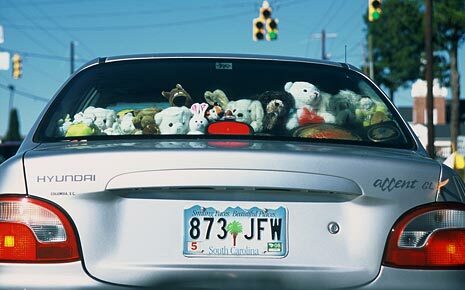 Also, I see a ridiculous amount of people who put stuffed animals in the back of their car so they’re looking out the back window. Why? Some of these people tend to be on the older side, so not sure if it’s some cutesy thing they’re trying to do? Seriously, if you have stuffed animals in your back window, what’s the deal with that? On my day off I got a much needed massage because work stress made my neck so tight I could barely move it. The lovely masseuse told me she hadn’t felt a neck that tight in a while. And clearly she put a lot of muscle into it because I still feel sore. This is probably blasphemy since I’m a lifelong New Englander, but I didn’t want the Patriots to win the Super Bowl. I’m a Red Sox fan so I know what a drought in championships feels like, so I thought it was well overdue for the Eagles to win it. Also, I think Tom Brady has become such an arrogant guy and if I hear more about his ridiculous eating regime where he thinks tomatoes are bad, I’ll probably throw something. You know what true love and devotion to your partner looks like? Watching the movie It with Q. I HATE CLOWNS. They are creepy and weird. I don’t even like the clown emoji ( side note: can I get rid of the emojis I never use? That seems like it’d be a useful hack for someone to figure out). So on Saturday night when we were trying to find a movie to watch, Q mentioned he really wanted to watch It, but had been waiting until I night I was out. I told him to watch it, as long as he didn’t mind me sitting next to him doing something else. I actually watched a bit of it, and because Q is such a wonderful, understanding partner, he would randomly yell “clown” any time Penny Wise would show up on the screen. You can imagine this ended up being pretty funny and actually enhanced the viewing for me– well the bits I watched anyway. It’s January. A month for hibernation. Unlike a lot of people it seems, I don’t hate winter. I’m a homebody, so winter just gives me more time to do that which I do best- lounging with books, tea, movies, cooking & baking at home. I don’t do the cooking part well, but I like trying. Plus, mixing things together and shoving them in the oven or slow cooker is really my only area of culinary expertise, so I appreciate the opportunity to do it more in the winter since I have a no-oven rule in the summer. If you’re not living under a rock, you’ve probably seen in magazines and around the internet the various Scandinavian ways of living/surviving/thriving through the dark months of winter (Hygge [Danish] and lagom [Swedish] ). I’m not Danish or Swedish, but I’ve been participating in hygge culture for most of my adult life. Staying at home with the fire and candles going, under a blanket, with a book and a cup of tea while wearing fuzzy socks? That’s me pretty much every season, minus the layers and warmth in the summer. 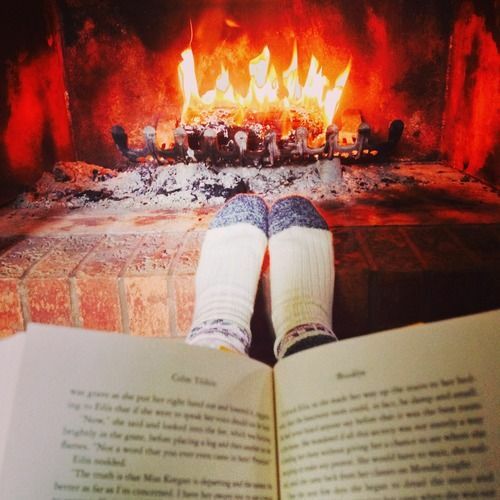 Not me, not my fireplace or book. Image from here. This winter I wanted to make changes to the way I spend my time at home this winter, and it’s had a very positive effect on my hygge. I DELETED all game apps from my iPad, (with the exception of the New York Times Crossword puzzle) to stop mindlessly engaging in junk instead of being present with Q and my own brain. But I still felt a bit lost when I wanted to be on the couch with Q, but could care less about what he was watching, so I downloaded the Kindle app to give ebooks a shot. 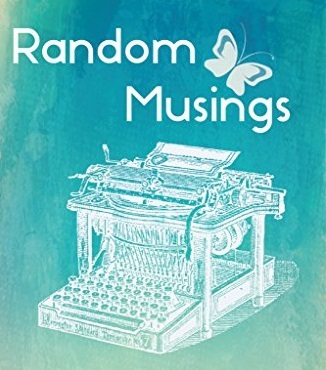 Since I’m always the last to get on board with technology, it should be no shock to anyone that I haven’t really read ebooks before, but I can now report that I get what all the fuss is about. I’m still not giving up on my love of holding a book, but I like having this other option, especially on nights when keeping the lamp on to read a book is bothersome to me. The adjustable brightness of the iPad ebook option is great. And I can read it on the treadmill! 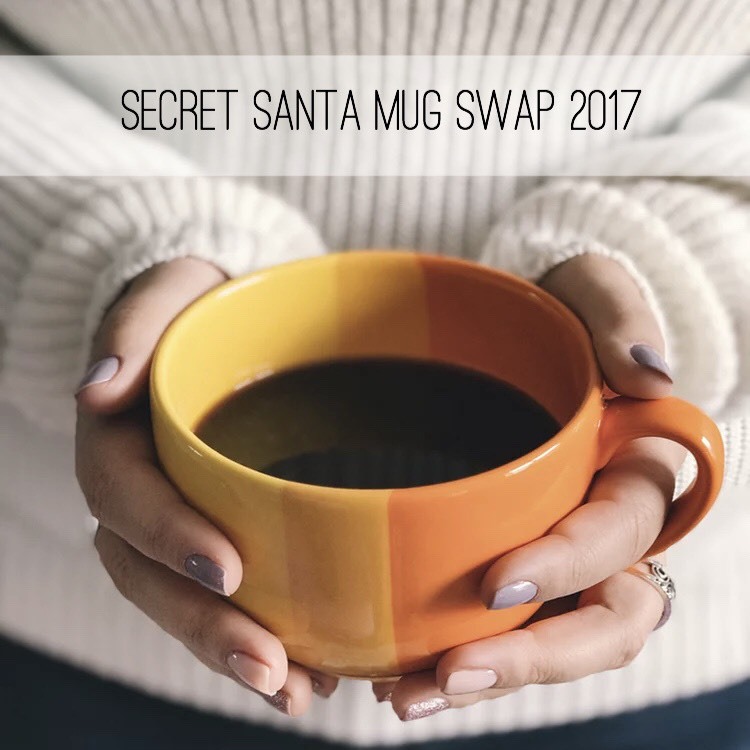 Thanks to the organizing efforts of San, there was another successful year of the Secret Santa Mug Swap! 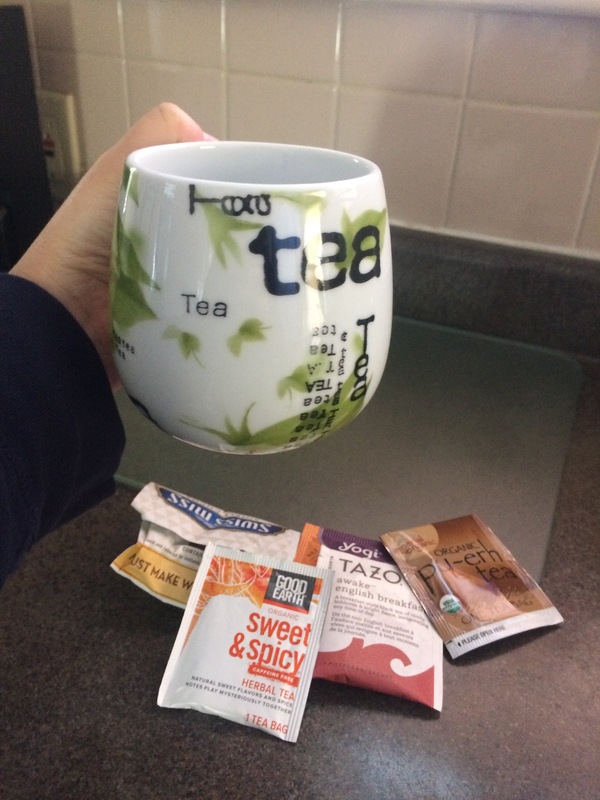 Here’s the mug & a few goodies I sent to my Secret Santa, Stefanie. 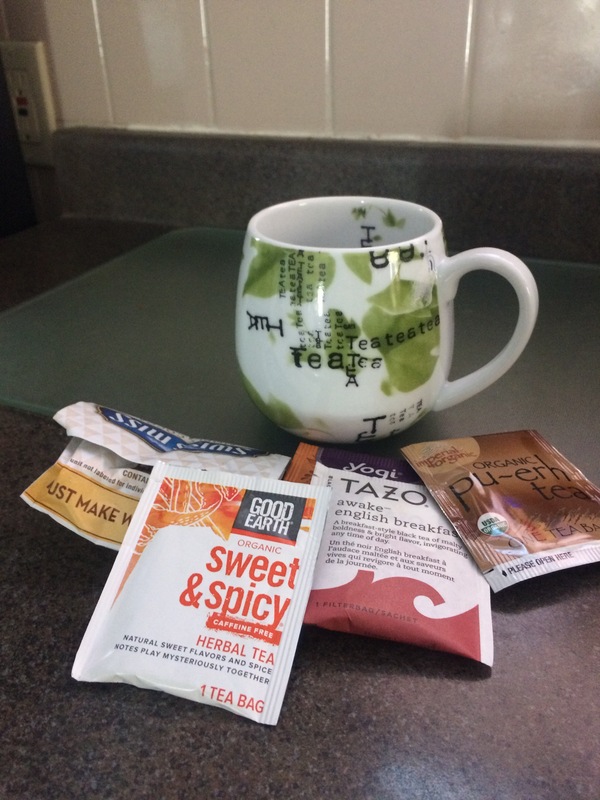 And here is the lovely tea mug and delightful teas I received from Erin! It’s the perfect cozy size for a cup of tea! Happy July! It’s actually been a full month already for me and we’re only 11 days in! With the dreadful rainy spring we had, I’m taking every opportunity to enjoy summer fun while it’s still here. Knock on wood, the weather has been delightful without a lot of humidity or super hot temperatures. Some July 4ths in the past few years have been unbearably hot, but this year was quite pleasant. I took the Monday off for a much needed extra long weekend away from work. 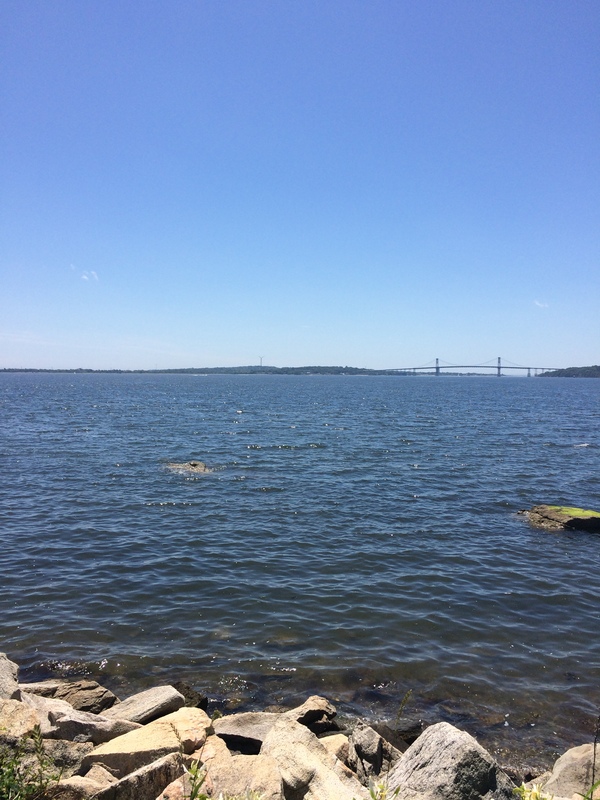 I’ve managed to do many things on my summer fun list- we went strawberry picking, I’ve been to the beach ( though only once), enjoyed eating outside and relaxation time by the water, and eaten lunch outside at work a couple times too. I’m excited for blueberry picking, a new open air market in my town, and am anxiously awaiting local tomatoes from my favorite farm stand. We don’t have any vacation plans quite yet, but are hoping to make it over to Martha’s Vineyard to see Q’s family at least for the day in August. I’d like to take a vacation in September, since that month has turned into more of a summer month than fall around these parts the past few years. With kids back in school and life quieted down a bit, I think traveling in September is more our speed too. Hope your July is filled with plenty of lazy days enjoying a good book, watermelon, and sunshine!